"Amber Walk at Ivy" 3 bed, 2 bath, attached 2 car garage. 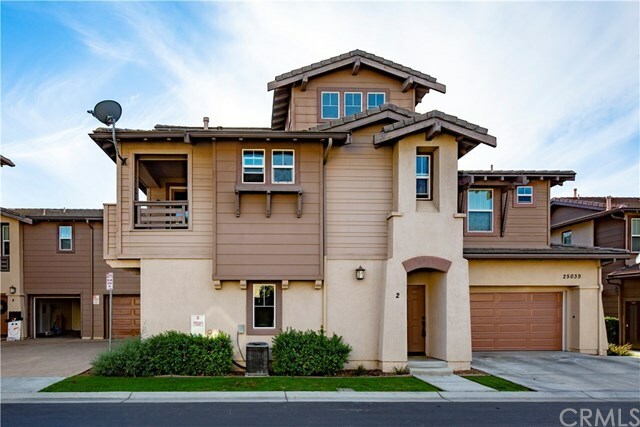 Nice gated condo community in West Murrieta! Here youâll find a lovely swimming pool & spa area with large BBQ and picnic amenities, great tot lot, all within close proximity to award winning schools, parks, and fabulous restaurants, shopping, the popular community town square and the up and coming Old Town Murrieta! Fun and in walking distance. This is a lovely 3 bedroom 2 bath home and just Up the stairs leads to the main level with a large dining area, laminate flooring and vaulted ceilings with natural lighting adjacent to a good size family room with ceiling fan and a cozy electric start gas fireplace and a balcony for outdoor lounging or dining. This home has Two main level bedrooms and full bathroom with the larger bedroom has direct bathroom access. Kitchen and main floor bathroom have a unique stamped concrete style flooring. At the top of the stairs is the master suite which makes for a private master area a ceiling fan and a walk-in closet. Along with a full bathroom featuring combined shower/tub and dual sinks. All condos has been recently painted outside for a fresh look in this well maintained community. Located in the highly sought after distinguished Murrieta Valley School District. Easy freeway access. Lower taxes and one of the lower HOAs!